One reviewer called this spread a must-make for the holidays. We agree, but don’t limit yourself to the holidays—it’s delicious year-round! Mix cream cheese and cheddar in medium bowl until blended. Add sour cream and apricots; mix well. Spread into 9-inch pie plate; sprinkle with nuts. Bake 25 to 30 min. or until nuts are lightly toasted and spread is heated through. Serve with crackers. 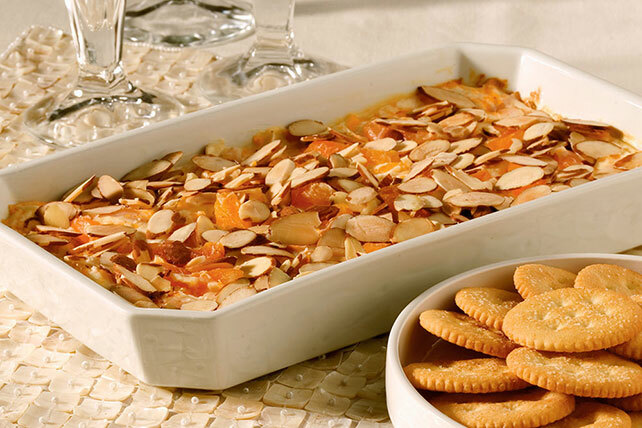 Enjoy the fruit and cheese flavors of this spread, but watch your portion size. For a spicier spread, add 2 Tbsp. mango chutney to the cream cheese mixture before spreading into pie plate.